For a most memorable luxury camping experience, our 16’ x 12’ Safari tents will transport your guests out to the Serengeti or Savannah. Our safari tent rental is an ideal size to create intimate lounge spaces at festivals, weddings, or parties (especially when paired with the TipiMarqui™ large gathering space). Lounge table and chair arrangements can spill out into open air to merge interior and exterior space at your outdoor event. This arrangement is successful for cocktail parties, benefits or other events in which event goals are to encourage movement of people to different areas of the venue. We have witnessed safari rental transformations with floor pillows, plush armchairs, day beds, and coffee tables. Some of our favorite creative events past include art galleries, and bride and groom preparation tents with free standing mirrors. Safari tents can serve as a posh staff or staging station or an attractive space to hide event items. Alternately, as a luxury camping overnight accommodation, the Safari rental can fit one king sized bed, two twin beds or even four twin beds. An entire tent village can hold a range of sleeping options. These white canvas wall tents have front doors that can be zipped closed to the elements or tied back to create an indoor/outdoor luxury camping space. A mesh window along the back side of these glamorous wall tents can also open to adjust for weather and create a cooling cross breeze. Your safari rental includes a watertight groundsheet covered with a fitted carpet. 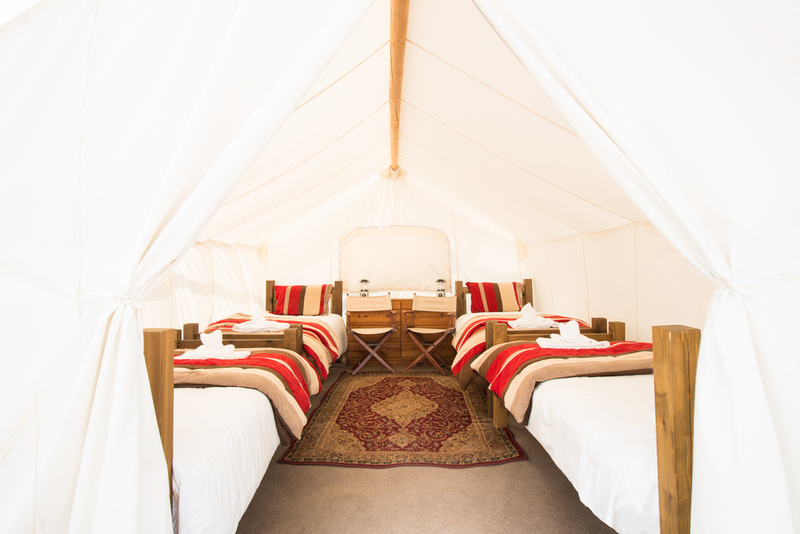 Safari tents can come complete with beds, linens, bedside tables, lanterns, chest of drawers, rugs, and safari chairs. Link to our full list of furnishings and bedeck your safari rental for true luxury camping. 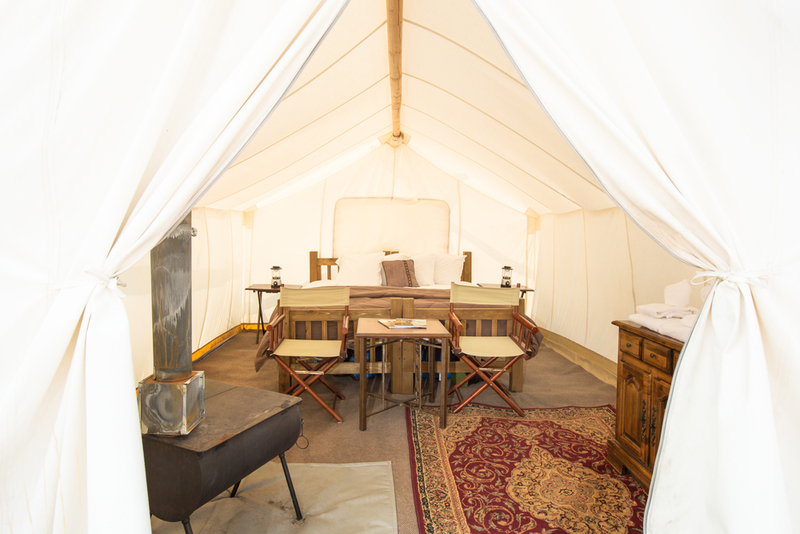 A safari tent rental is the most sumptuous outdoor lodging possible!